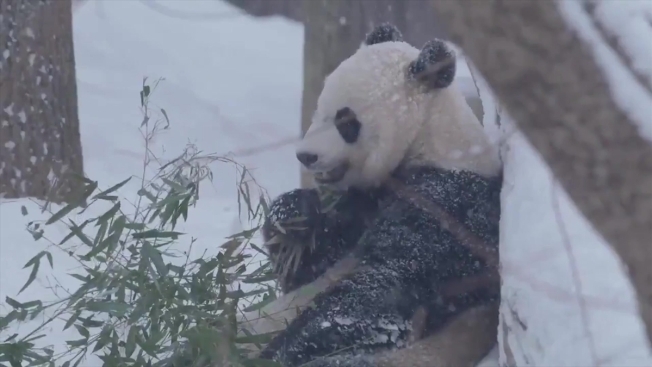 Wednesday is a snow day, and you know what that means: The National Zoo has gifted us with another glorious video of its giant pandas rolling around in the snow like kittens enjoying catnip. The zoo posted this video to Twitter showing Mei Xiang and Bei Bei tumbling, rolling, climbing and doing everything possible to cover themselves in snow. In the metro D.C. area, between 2 and 4 inches of snow fell throughout the region before noon, with areas including Ashburn, Fairfax, Germantown and Damascus getting more than 4 inches of snow. Storm Team4 says about 3 inches of snow fell at the National Zoo. The snow switched over to sleet and freezing rain in the afternoon and it's expected to continue to rain through the evening. Check here for more on the forecast.